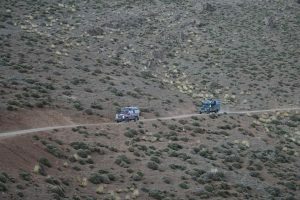 The trip to Morroco was the second main shakedown trip before “the big one” and was designed to push Nelson with a broad range of challenges from long motorway runs to river crossings and steep rock tracks. The trip did all of this and more ! 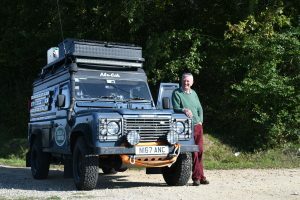 We were in a group of four Land Rovers, Overland Birds (Neil and Julie), Polaris Overland (Dave and Angela) and Gnash and Kim so we had a good level of back up and good company. On the first leg of the trip I went to the Adventure Overland show at Stratford on Avon which is a great gathering of many of the overlanders in the UK, Nelson was on the stand for Errol as an exibit of his work and i was able to do lots of catching up with chums and the Overland Sphere team including Neil and Julie who would join the Morroco “raid”. 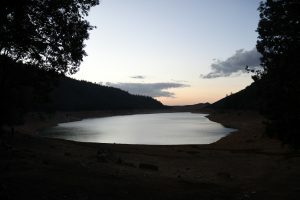 After the show and a few days work in London my friend Nick joined me for the run to Madrid, which was the first test of the variable co-driver and worked out very well, we chatted all the way through the B roads in France and had a nice time all the way to Madrid. 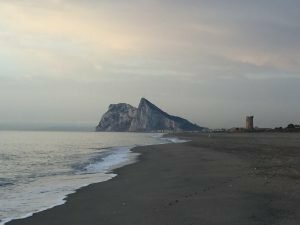 After Madrid I headed to Santa Pola to meet up with some of the crew for a decent dinner and on to Malaga airport to pick up Duncan Mackenzie for the main drive in Morocco. We had hoped to have the Lizzybus crew with us but they got to the port and realised that Davids back was getting really bad so they turned back and Dave headed to UK for surgery. Our first day in Morroco was in the blue city of Chefcaoun which was a great introduction to the souks and sights of a small town. Culture was added on the second day by a visit to the Roman ruins at Volubis before we headed into the Cedar Forests for a camp by the lake above. After some very exciting driving over the atlas mountians making our way over tiny tracks and washed out roads we were able to travel into the Dades gorge on a road that we were later to learn was actually closed, so lots of low ratio and bouncing was needed to get us through but the views were spectacular. 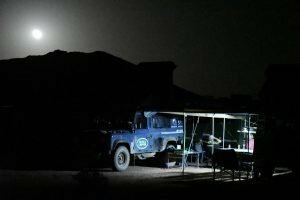 We ended up in a nice Auberge in the Dades george as night was falling, but a nice Tangine and some beer from our fridge restored us all to good health and settled frazzled nerves after such intense driving. 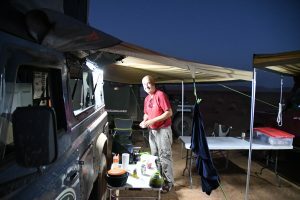 We moved on to the desert after a visit to the old city of AltBenhaddu and were able to camp for a few nights under the stars, Duncans culinanry skills came in very handy in making a decent meal from some local lamb. A bright moon made for a very atmospheric camp thankfully someone had checked the moonrise so we were able to do some star/milky way gazing before the mood lit up the sky. 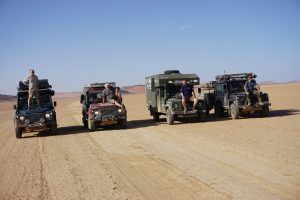 We had opportunities in the desert to experience every sort of terrain from sticky mud, to soft sand dunes, flat ‘pistes’ and rocky paths, it was a great test for all the systems on the truck as we would need to air down, crawl over rocks, drag through deep mud with all lockers on and speed across the piste. 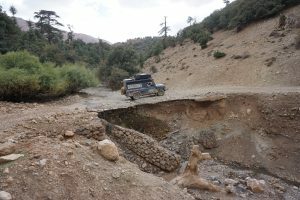 Eventually we came to a river cutting the road that had been washed out for four or five days, in fact the day before a guy tried to cross with his KTM bike and got swept away and big unimogs had been turned back. However the river had dropped a good bit and once we dug out the vertical bank to make a ramp we were all able to cross safely, wading plugs in and snorkles and diff locks in action. Nelson went first leading the way ! Above we are getting ready and below you can see Gnash digging out of the river bed ! We toured around the sand dunes of Erg Chebbi and fought our way through very sandy and muddy tracks on the way. 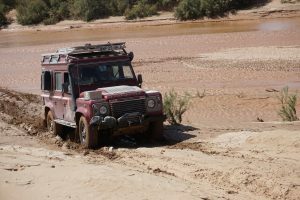 It was very exhausting driving as the ruts and pot holes were very tricky, at one point a front wheel caught a rut and we were flung sideways but thankfully did not tip over due to a quick bit of opposite lock and power. 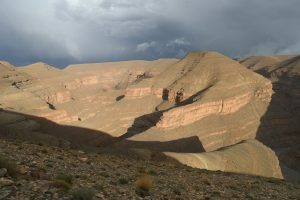 Duncan and i did a loop around the famost circle jaffer where the road was a bit hairy in spots, see the thin crust under Nelson below, cleverly Duncan decided to get out and take the photo, i wonder why! With Duncan dropped at Malaga i had a fast run to Madrid to pick up Lee for a very fast motorway trip to Munich, Parma and all the way to Amsterdam – we did not take so many photos but this was a great test of Nelson as we did about 2500 miles in only five days much of it at 70mph and we had no problems at all. Thinking that this car was in bits to get a new chassis only a few weeks before that is a real credit to the guys at Gemm 4*4 who did the work!